I recently visited the Art Gallery of Ontario where Toronto artist Jon Sasaki is showing his installation: Pine. At times, it's funny; and at other times, it's sublime. But it's mostly an accessible nod to image-making and recontextualizing iconic landscapes captured in paintings. For Pine, Sasaki visited Canoe Lake in Algonquin Park where Tom Thompson created some of Canada's most recognizable paintings. Instead of an easel and paintbox, Sasaki used tools used by some contemporary artists: a video camera and an eight-foot crane. 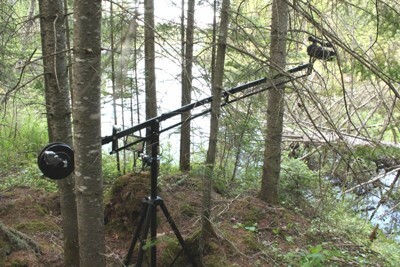 The video itself captures bumps and crashes as the camera operator attempts to rotate a camera and crane 360 degrees through the folliage. Sasaki's installation demonstrates the folly in attempting to capture pristine beauty in nature as the camera-work in the shot is mostly imperfect. But the video achieves moments of sublime elegance as the camera soars above the trees to provide a breathtaking view of the lake. 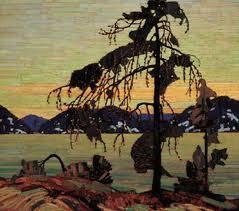 It's not Tom Thomson, of course. But it's a smart re-imagining of the landscape. The installation includes a lightbox image of the crane and camera in an image reminiscient of Thomsson's oil on canvas paintings, such as "Jack Pine" (1916-17). I have always enjoyed Sasaki's work -- as with his previous works at Nuit Blance 2008, I Promise It Will Always Be This Way. Do you remember the mascots at Lamport Stadium? I've blogged about the works at Nuit Blanche before, and it's where I first encountered Sasaki's work. I'm looking forward to Sasaki's next project.